As we headed away from the coast, the sea mist cleared and the sky was wide and open and blue above us. The ground rose, taking copses and streams into its folds, the fields just beginning to shoot. 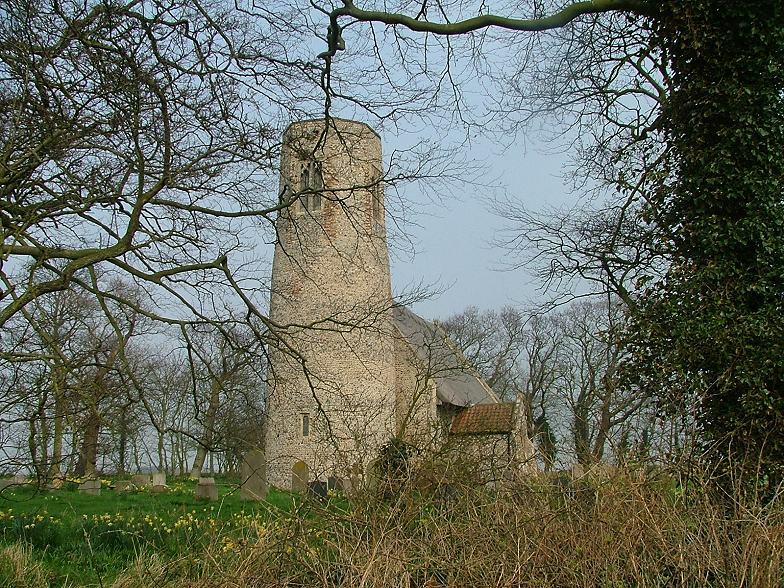 Off on a hill top, in a glade of bare trees, was the round tower of All Saints. It must be completely concealed in summer; but we had seen it all morning, off in the distance, from Bacton and Witton and Paston. The road took us down into the little village, and we were north of the church; but only a path led up to the churchyard, and the road took us away, and around clockwise, almost 270 degrees, until at last we were at the end of a track about half a mile from the west tower. We headed on, climbing in a dip enfolded by the fields, and then into the open. Empty Norfolk spread all about below, and here at the end of the track the silence was complete, except for birds arguing in the branches. Thousands of daffodils spread around the church. In construction, the tower is familiar; late Saxon at the bottom and late medieval at the top. But here, there is no break; one part flows into the other, as if it had melted in the heat, or a giant had smoothed it with his great hands. We stepped into the cool interior. The silence deepened. 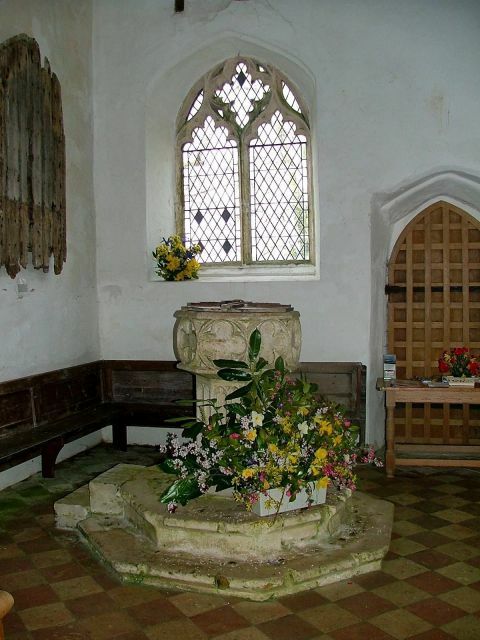 The inside, under crooked, silvery beams, is ancient; but neat, bright, full of flowers and a sense of life. And yet, we are in a wide, empty parish, with hardly any houses, and the nearest of those nearly a mile away. As simple as the interior is, it has more than its fair share of medieval survivals. The font is pretty, simple quatrefoil panels on a tiered octagonal pedestal. 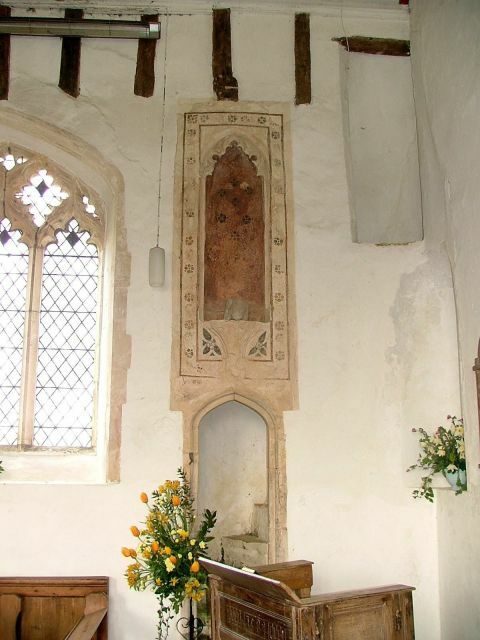 Behind it on the wall hangs the 'Paston door', the original 12th century north door of the church. The south door is old too - only the cut-down organ strikes a jarring note at the west end of the church. 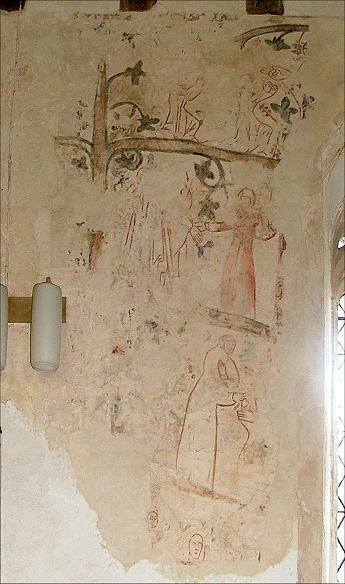 And on the north wall, a sequence of wall paintings, probably from the late 14th century. The first is part of a sequence of the Seven Works of Mercy. 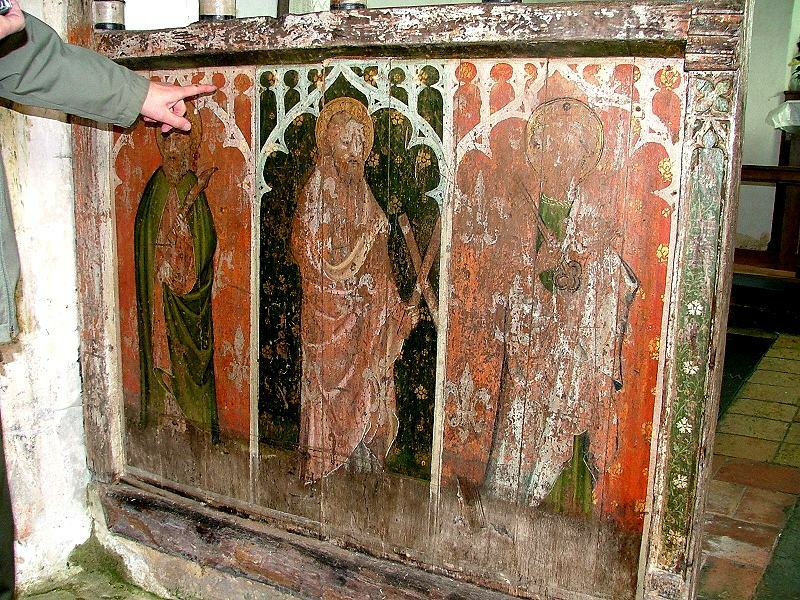 The two full scenes are probably sheltering the homeless and feeding the hungry, but Anne Marshall of the Painted Church site thought that the two figures at the top, rather than being a third scene, might actually be the donors of the piece. 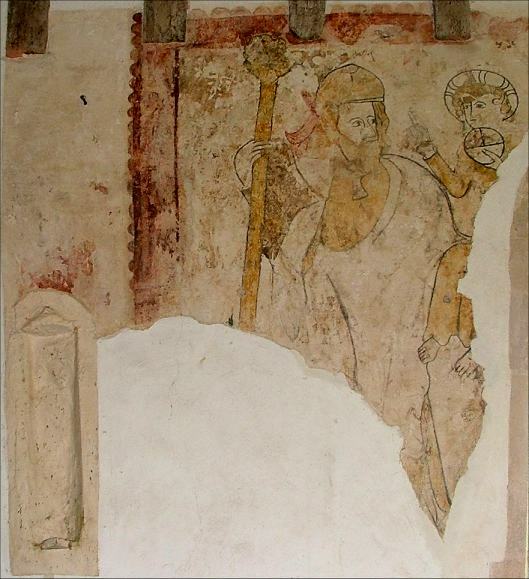 Next, comes a St Christopher, with a niche between this and the previous subject, and then a massive painted and elaborated niche above the entrance to the rood loft stairs. 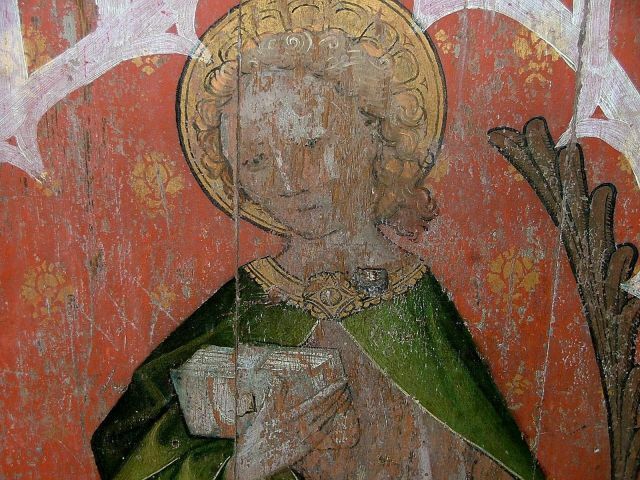 The roodscreen is another early one. The circular tracery is reminiscent of the screen at Merton, way across the county. 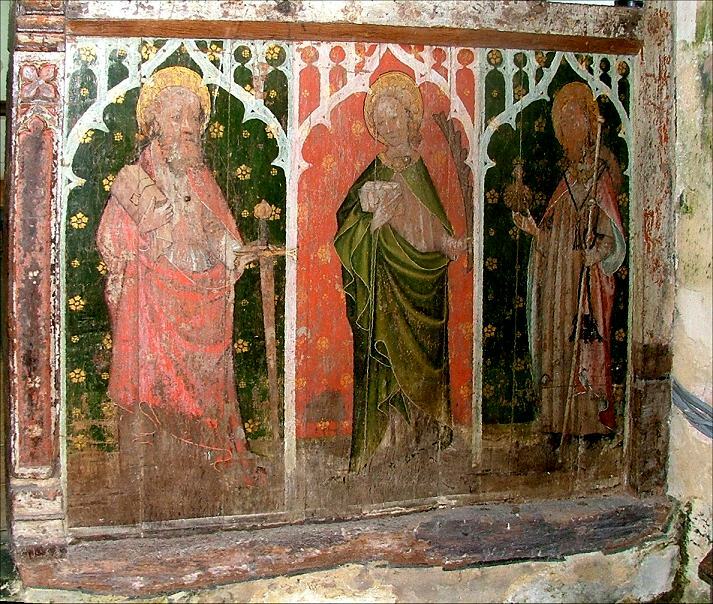 The panels depict six apostles, and have been curiously restored; although the figures themselves appear untouched, ogee-arched tracery has been painted in white above them. And yet, if you look closely you can see flowers showing through the white paint, suggesting that there never was tracery here originally. On the north side are St Bartholomew with his flencing knife, St Andrew with his saltire cross and St Peter with his keys. 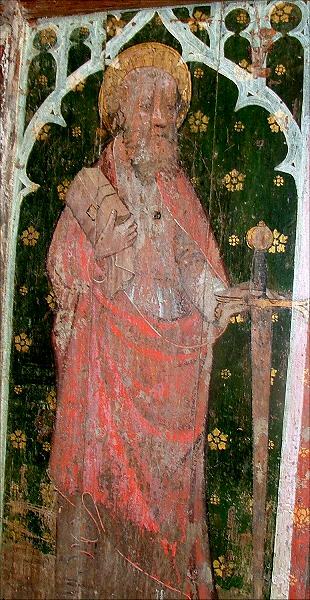 On the south side are St Paul with his sword, St John the Divine with his book and martyr's palm and St James with his staff and scallop shell. 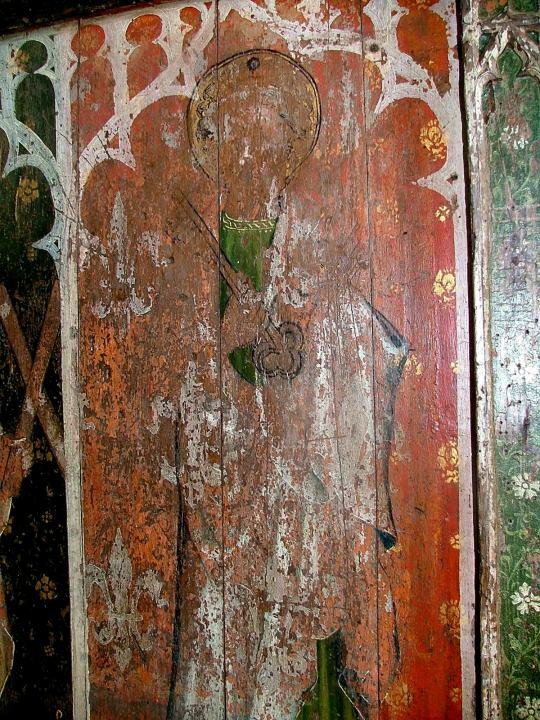 A piscina on the south side has naive foliage painted on it and a cross, in a late Victorian hand. Perhaps the most unusual object here is the Elizabethan reading desk, dated 1587. There are also a couple of pre-Reformation brass inscriptions, but even if there was nothing of interest here, this would still be a special place. It has a very special dignity and simplicity, wrote one man who knew the church well. He saw it in the 1930s, standing there on its low hill above the harvest fields as though it were the faithful servant of the life around it. Not Arthur Mee, but the writer and poet Siegfried Sassoon. He spent childhood holidays in Edingthorpe, long before the War that would make his name and change this country forever. He came back here as a man, and was delighted to find a rare corner that was unchanged; and so it remains today.